The Power Management tool includes a utility that lets you customize the wattage settings for similar computers for more accurate power management reporting. The settings that you select and create in this dialog box are used in report calculations. The default settings displayed in the Custom wattage settings dialog box are based on the type of computer referenced in a report. For a desktop computer, default wattage settings are based on the average settings of a typical desktop computer. For laptop computers, the default settings are lower because laptops typically use less power. On the toolbar, click the Customize button ( ) and select Custom wattage settings. Select the Chassis type (Desktop or Laptop). 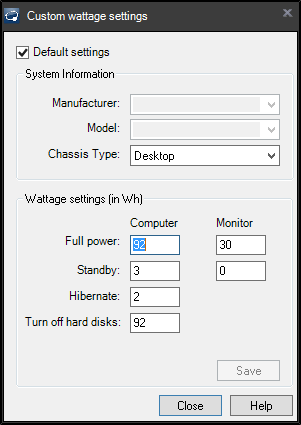 In the fields under Computer, change the wattage settings to specify wattage used by the chassis type you selected, in different usage states. In the fields under Monitor, change the wattage settings to specify wattage used by the monitor when on full power and on standby. You can use pre-configured custom power settings to match the type of equipment you are using. Many power settings for popular desktop and laptop computer manufacturers have been added for your convenience. For example, if you are monitoring the power usage on a Dell Inspiron 531s desktop computer, select Dell Inc. from the Manufacturer drop-down list and Inspiron 531s from the Model drop-down list. The wattage settings for the computer and its monitor have been added based on the data returned from a Ivanti inventory of an Inspiron 531s computer. Clear the Default settings check box. Select the Manufacturer and Model for the device type you want to use. Click Close to save the data for that model. Repeat steps 2-4 for each model you want to include in power usage calculations. The wattage settings you save are matched to managed devices that you include in reports. When the Default settings check box is selected, the wattage settings fields display the average power usage of a typical desktop or laptop computer. When the Default settings check box is cleared, use these fields to enter power usage settings for specific computer brands and models that aren't in the manufacturer and model lists. If the type of equipment you want to manage does not appear in the pre-configured System Information drop-down lists, you can enter the information you need manually. For accuracy, you'll need to gather the usage information from the manufacturer's sources. Type the Manufacturer name and the Model name/number for the device type you want to use. Select the Chassis type that matches the device. Add wattage data for the computer and monitor in different usage states.